An earthquake with a magnitude of 2.8 has been recorded in a county hit by a series of tremors, the British Geological Survey (BGS) has confirmed. 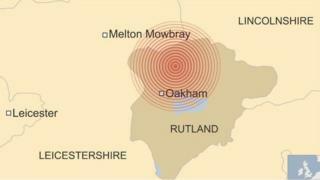 The epicentre was near the town of Oakham in Rutland, in the East Midlands, at 22:40 BST on Tuesday. It is the ninth earthquake to be recorded in Rutland since April 2014, when there were three in one month. The largest tremor was recorded in January of this year, and had a magnitude of 3.8. However, some people reported feeling the latest earthquake more strongly than previous quakes. BGS seismologist Paul Denton, who lives in Rutland, said this could be because the earthquake was more shallow. "It was a very, very shallow earthquake, so it only happened about 2km under the ground, whereas the other ones were a little bit deeper than that," he said. The BGS has received more than 500 reports from members of the public, all within a 20km (12-mile) radius of the epicentre. More than a third of those people reported having been frightened. One report to the BGS said: "There was a boom and I thought the upstairs ceiling was going to collapse." Another said: "I was woken with a large bang as though someone was trying to enter the house with a battering ram." Image caption The BGS has received more than 500 reports from members of the public so far, all within a 20km radius of the epicentre. David Galloway, another BGS seismologist, said earthquakes were not unusual. "We record about 200 earthquakes somewhere in the UK over a period of a year," he said. "The fact is, we live on a dynamic planet where there are lots of tectonic plates that are moving about. "Oakham is quite a populated area so it's felt more widely because there are more people to feel it." He has looked through BGS records going back to 2010 and found nine recorded earthquakes in Rutland, which were all between April 2014 and this week. Sir Clive Loader, Police and Crime Commissioner for Leicestershire and Rutland, tweeted: "Wow - just had another earthquake here in Rutland. Perhaps not as strong as ones over the last couple of years, but still quite a sensation!" Reg Burrell tweeted that he felt it in Castle Bytham, a village in Lincolnshire. John Kennedy, from Oakham, said his whole house shook. "Thirty seconds before it went off, the dogs suddenly started barking or howling. It was as if they had felt it before it happened," he said. "It really is getting quite scary now. "We are getting to be famous now, not only for being the smallest county, but also for the most earthquakes." The British Geological Survey is asking people to fill in a questionnaire if they felt the earthquake.